She has been in and out of foster homes since she was just a baby and began living alone at 16, struggling to keep food in the fridge and get herself to work and high school. Today, Vicky Lindsey is poised to graduate from Wright State University and pursue her master’s degree in public administration at Cleveland State University, where she hopes to champion foster students like herself. Lindsey arrived at Wright State on Sunday, Aug. 17, 2014, and quickly settled in to Hamilton Hall. The years of living on her own had given her a sense of independence and confidence that many first-year students lack. Lindsey initially majored in nursing but changed to communication studies her second semester, feeling it would give her many career options. She worked on campus as a tutor and a patient assistant for students with disabilities and became fluent in sign language. She also worked the third shift at Walmart in Beavercreek and currently has a job in home health care. Lindsey was placed in foster care when she was 6 months old. Although she would return to her Cincinnati home for brief periods, she and her mother constantly clashed and Lindsey would find herself back in a foster home. When she was 16, Lindsey got her own apartment in Cincinnati through an independent living program that paid the rent, but nothing else. She made ends meet by working at Kings Island and United Dairy Farmers. When she wasn’t at home or at work, Lindsey was at Woodward Career Technical High School — giving everything she had. When she suffered asthma attacks and had to be hospitalized, she had friends bring her schoolwork so she wouldn’t fall behind. She threw herself into her medical assistance classes, learning how to take vital signs with medical mannequins and getting hands-on clinical experience. Despite her workload, Lindsey found time to play varsity volleyball and join Young Women Writing for (a) Change, a group of about 20 female students who develop their writing skills together and share confidences. When the dust cleared on her high school academic career, Lindsey was second in her class of 100, winning a valedictorian/salutatorian scholarship from Wright State covering tuition. But a major reason for Lindsey choosing Wright State was the university’s Independent Scholars Network, an innovative program that nurtures, educates and graduates emancipated foster students. During her time at Wright State, Lindsey has been actively involved in the Black Student Union and was named a WSU Emerging Leader and WSU Established Leader in 2015 and 2016, respectively. As part of the Independent Scholars Network (ISN), she was honored with the ISN Most Volunteered Hours 2014-2015, the ISN Jet Setter Award 2014-2015 and the ISN Academic Excellence Award 2014-2015 and 2015-2016. Lindsey’s foster mother died in the summer of 2015. Lindsey is scheduled to graduate in December, a year early thanks to multiple 18-credit-hour semesters. 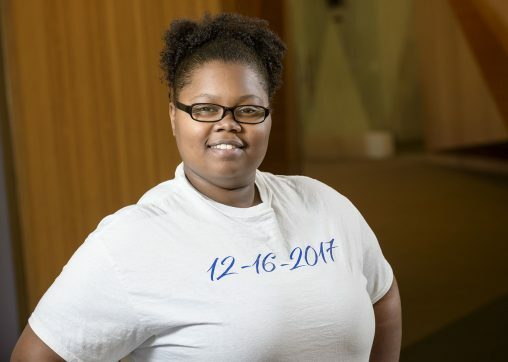 She plans to begin pursuing her master’s degree in public administration at Cleveland State and hopes to eventually work at a nonprofit and then run her own nonprofit. Lindsey’s ISN mentor is Kurt Holden, a patrol sergeant and crime prevention specialist with the Wright State Police Department and former foster youth. Holden said only about 5 percent of former foster youth graduate from college and Lindsey will have accomplished it in only three years. Lindsey intends to get involved in Cleveland State’s foster student program when she is there. Her message to fellow foster students is to find a strong support system and never give up.